Dietary recommendations regarding fat intake seem to change with the decade. A recent report continued to question the “healthiest” type of fat. A March 2014 article in the Annals of Internal Medicine reported that decreased saturated fat intake did not result in a decreased risk of heart disease. Following this surprising report, the media began to report that there was no harm in unlimited consumption of saturated fats like coconut oil, animal fat, and butter. If decreased amounts of saturated fat didn’t help, what’s the harm in eating more? Highly saturated coconut oil, in particular, is now being promoted as a cure for various health conditions including Alzheimer’s, heart disease and obesity. But is coconut oil actually beneficial? Coconut oil contains high levels of saturated fat, higher levels than butter. Ninety-two percent of the fat in coconut oil is saturated compared to 15% saturated fat in olive oil and 62% in butter. Unlike other oils, coconut oil can be solid or semisolid at room temperature due to the multitude of saturated chemical bonds. Conventional coconut oil is made from dried coconut that is pulverized, cooked and treated with chemicals. It is used in candies, coffee creamers and movie theater popcorn. 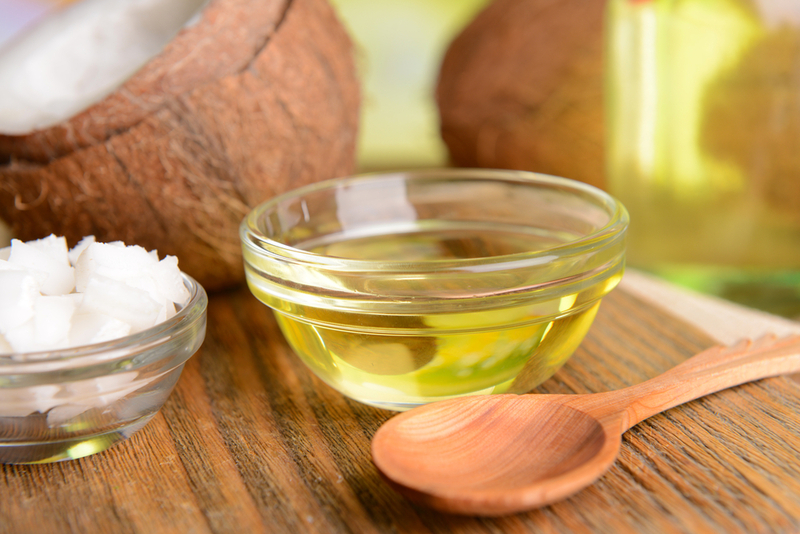 Relatively new to the scene is virgin coconut oil which is extracted from fresh coconut meat. Virgin coconut oil is promoted as being healthier than conventional coconut oil. So should we be switching to coconut oil? In regards to heart health, coconut oil like other saturated fats, increases “bad” (LDL) cholesterol. High levels of LDL contribute to heart disease. Liquid vegetable oils (olive, canola) do not increase LDL. On the other hand, coconut oil, like liquid vegetable oils, also increases “good” (HDL) cholesterol. But is this elevation in HDL beneficial? That is unclear. For now, most experts agree that coconut oil is a better choice than butter or trans-fats but there is no evidence to suggest coconut oil should be substituted for liquid vegetable oils. People who regularly eat extra-virgin olive oil in place of saturated fats have a lower risk of heart disease, high blood pressure and stroke—and lower cholesterol. As far as the other coconut oil health claims go, there is no solid science to back them up. More research is needed to support coconut oil’s purported therapeutic benefits. So for now, stick with the recommendations in the Dietary Guidelines and choose unsaturated/beneficial fat sources and limit saturated fats to 7-10% of calories. Bottom Line: saying something is not harmful does not mean it is good for you. This entry was posted in Cooking, Food, Health, Heart Health, Lexington Medical Center and tagged coconut oil, healthy eating, Jennifer Benedetto, lexington medical center., nutrition by lexingtonmedicalcenter. Bookmark the permalink.